We posted a gallery of Hurricane Sandy as told by Instagram and Twitter earlier this morning, but those were definitely not the only social networks people used to communicate with their friends, families, and followers. Social media sure got #Sandy starting late last week, surging in tweets, statuses, and photos by Sunday night and well into Monday when the hurricane made landfall across the east coast. Facebook also has its own metric meter, Talk Meter, to measure the chatter that goes on in the social network. A quick glance at the statistics showed that Hurricane Sandy made bigger waves than the presidential debates, with a Talk Meter rating of 8.34 (on a 1-10 scale) over the first presidential debate’s 8.18. Sandy’s 8.34 number also makes it the number two most buzzed about topic in 2012 so far, just following the Super Bowl. Twitter was one of the largest go-to sources of the most recent updates by city officials, public transit authorities, and news outlets on top of the average tweeter sending in their perspectives of what was happening in their neighborhoods. The site also set up its own #Sandy hashtag page for news relating to the event, complete with top tweets of the most shared news links and photos. Twitter users were also able to search hyperlocal tags to check out what was happening in their neighborhood, such as #ConeyIsland, to see how the historic area managed on Brooklyn’s southern coast. Some companies also used Twitter to clarify rumors that virally spread over the Web. Take for example Con Edison, who took to its official account to shoot down false information about workers trapped in a building post-explosion at its 14th street power plant. New York City’s Metropolitan Transportation Authority (MTA) also used Twitter to update commuters with damage notices to certain train stations, and estimate when services may be restored. 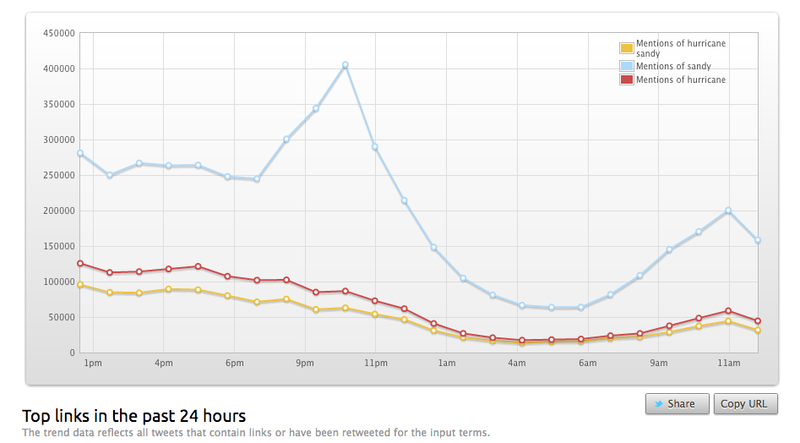 Surges of tweets relating to Sandy spiked between 7 to 11 p.m. eastern time, right around when the hurricane made landfall in the tri-state area. 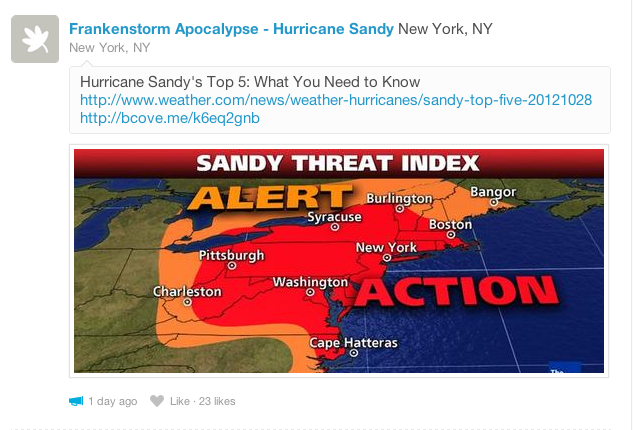 Although Twitter feeds were flooded with Sandy-related tweets, more fake rumors and pictures were also being virally shared. In particular, a photo of the Statue of Liberty with an ominous cloud swirling behind her was one of the more infamous shares, while plenty other users who spotted the photo were quick to note that the picture looked way too Photoshopped to be real. That’s the thing about Twitter; as easy as it is for someone to spread false information, it’s just as easy for thousands to call them out for it. Also, if you see any photos of sharks in the flood water, you can be absolutely sure those photos are, in fact, fake. 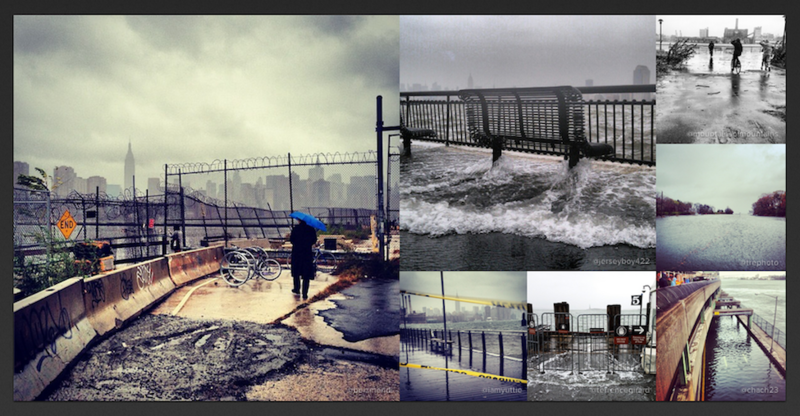 Instagram took it its blog to announce that the site saw roughly 10 photos per second uploaded onto the social network related to Sandy. As of 12:30 p.m. eastern time, the Instagram tag #Sandy has accumulated more than 484,600 photos while #Frankenstorm garnered roughly 38,000 so far. 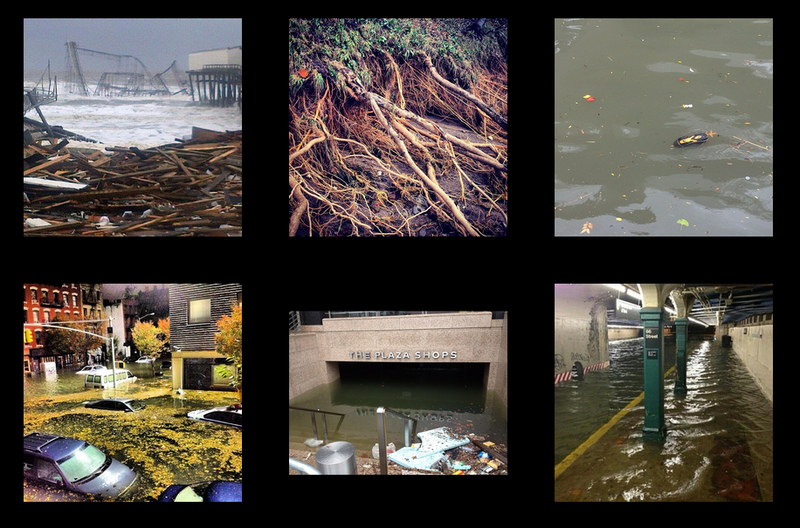 Streams of Hurricane Sandy photos were also available on sites like Instacane, and the real-time Instagram feed Now.jit.su revealed more Sandy-related photos than ever. As high as these numbers are, they’re rather unsurprising since photos are the best way to illustrate the magnitude of the hurricane’s devastation. It’s a Foursquare classic for topical check-in spots (mostly anything that ends in -pocalypse) to pop up during current events, and Sandy was no different. More than 40,000 check-ins were made at the New York City-based Frankenstorm Apocalypse – Hurricane Sandy, with photos, updates, and tips shared amongst users. Not all tips are particularly helpful, however, since Foursquare users tend to joke around a bit with Pocalypse-type locales. Such is the case with the most liked tip at Frankenstorm Apocalypse, likening Sandy to the promiscous ways of Jersey Shore‘s Snooki Polizzi. “For an event of this nature, it’s a surprisingly effective tool,” writes Chris Thompson of the unofficial Foursquare blog.